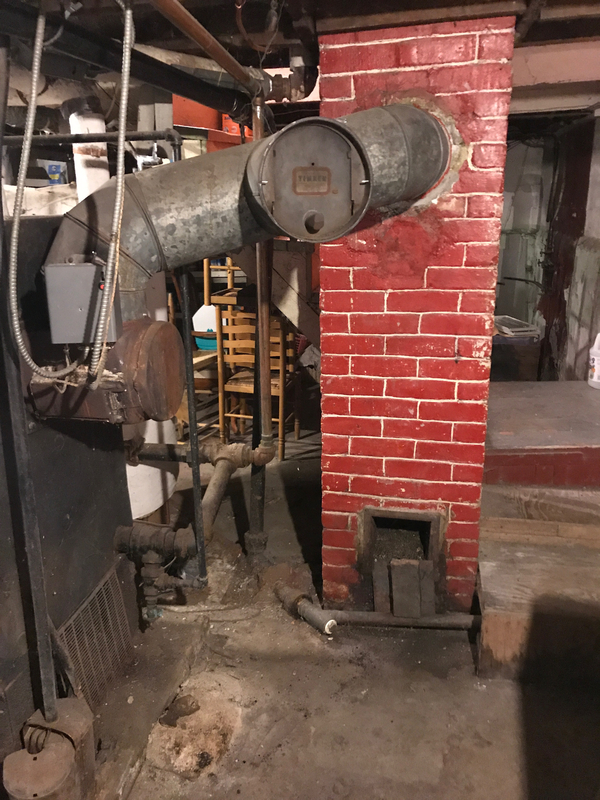 I have an old house that had been running an oil fueled boiler and an oversized wood stove off the same chimney. I removed the wood stove and solely relied on oil in the last 2 years. The boiler is a National Heat Extractor H 205 that has an expansion tank in the attic (see pictures) a month ago there was really loud banging that came from the chimney. The water level on the expansion tank showed empty so I slowly added water with the valve you can see behind the red inspection tags in the pictures. I had someone on speaker tell me when it got halfway. This kept it down for about 2 weeks and in the past two weeks there has been quiet but strong bangs which is typical of the boiler. The water level does not go up at all (might not be adding enough water but I don't want to have anything explode) I also notice when it firsts fires up I smell some kind of gas in certain areas of the house, all close to the chimney. It goes away very quickly and varies in strength (The boiler runs on oil). The boiler needs replacement but my budget calls for the most economical short term fix, would that just be adding water to the tank until that level goes up? 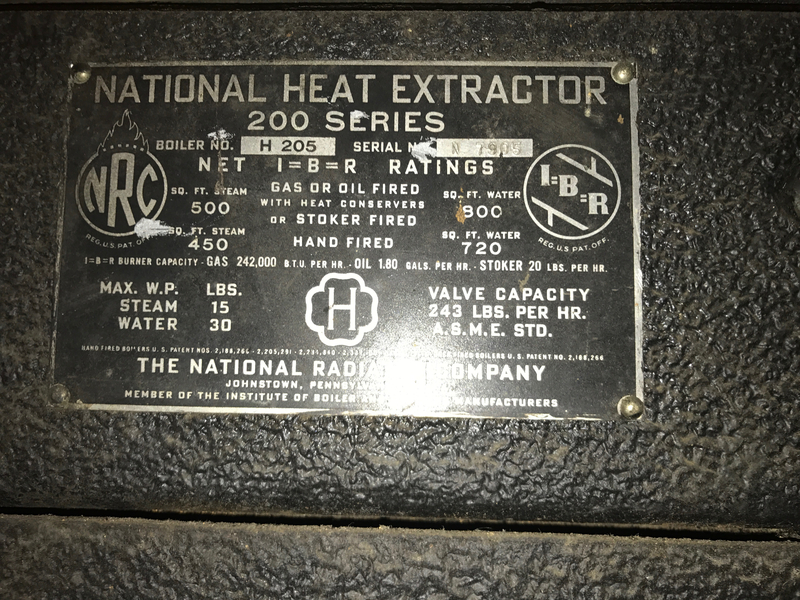 I would love any thoughts/comments on the boiler and its status. Oh and the pressure/temp gauge does not work. Not steam. Hot water (gravity? I see no pumps!). You do need to keep the water in the expansion tank about half way up the gauge glass -- it shouldn't be dropping much. If it is, you have a leak somewhere. That's not a problem which needs immediate attention. Smelling fumes when the boiler starts which go away soon afterwards is not good news. That almost certainly indicates that there are cracks in that chimney which are letting fumes escape into the house until a draught is established in the chimney. Please do two things, as soon as you can (like tomorrow) -- get yourself some carbon monoxide detectors for each bedroom and anywhere you smell fumes; if they alarm -- leave. And find a really good chimney sweep (they do exist) to inspect that chimney. Budget or no budget, this is not something you can safely ignore. A house near us burnt down when a failing chimney started a fire. Chimney issues are not something to be ignored. Also, the above is correct. You have gravity hot water, not steam. Jamie is right it is a gravity hot water system. He is also correct about needing a chimney sweep and buying several good Carbon Monoxide detectors. the new tridicator gauge which does three jobs it indicates altitude, boiler pressure and boiler water temperature it in place of the existing tridicator gauge. You need to know what the boiler water temperature is at all times as it should be no higher than 180 degrees at the high limit of Fahrenheit degrees for a gravity hot water system. The altitude portion of the gauge shows what the height of the water is in the system. If you have a three story house you definitely in the tridicator gauge. right now you have no way of knowing the water temperature in the boiler unless you have an infrared temperature gun. 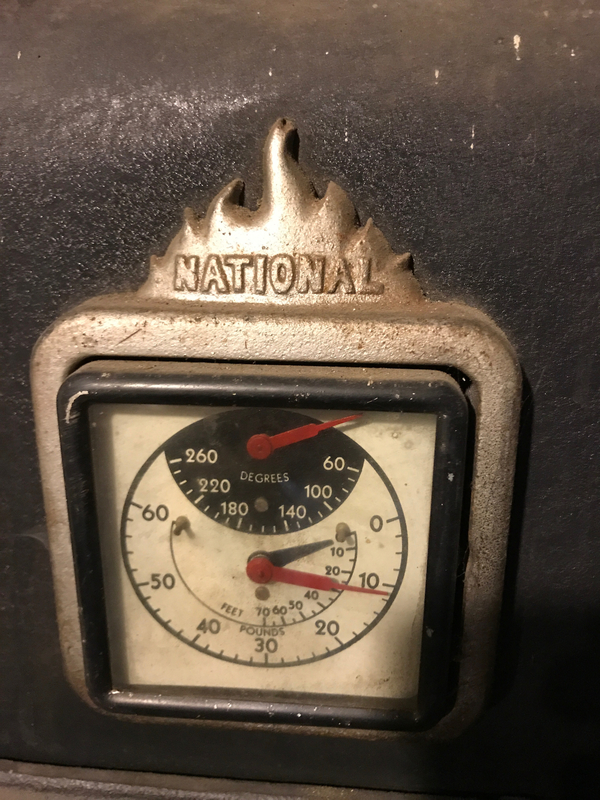 I have a Marsh Instruments Tridicator Gauge for my dual fuel coal stoker boiler and it is a very reliable method to check your system every day or when ever you add water. The steel line that is at the end of the tank is the overflow line that should be draining back in to your basement. When you fill the system back up you or someone else needs to watch the overflow lines discharge point to be sure the open to air expansion tank has enough water each and every time you fill it. The overflow pipe is either 1/3 or 1/2 of the way up the end of the tank. You need water in your sight glass at the overflow point or a little lower in the Open To Air Expansion Tank at all times to assure the system has enough water in it AT ALL TIMES. You need to have someone find the leak if it exists as it should not be hard to find. When you replace the old boiler you can leave the open to air expansion tank in the attic hooked up to the system as is and maintain your gravity hot water system. Not having or requiring circulators to deal with and a nice even heat in the home at all times is ideal and saves you money. 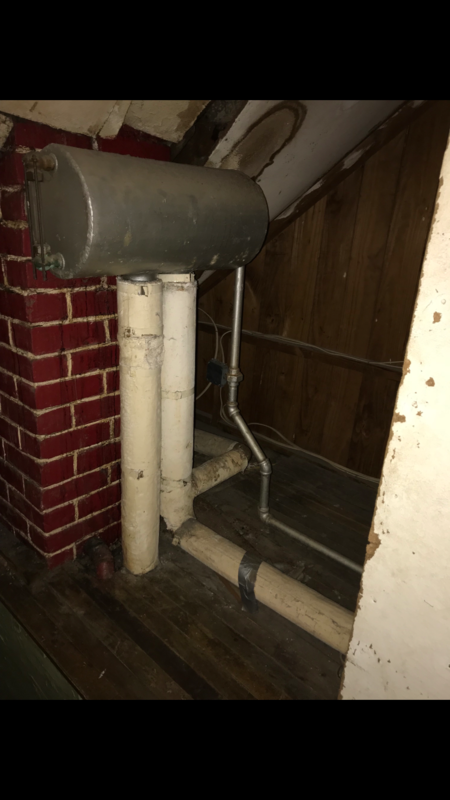 A while back a member needed to have a new expansion tank made and he has an overflow pipe that dumps excess water in the laundry sink in his basement when he fill it as needed. You need to have some work done on your chimney and purchase some Carbon Monoxide detectors for your families safety. You have an old boiler that can be used with oil, gas or as an anthracite coal stoker. The laws of physics will out-weigh the laws of economics every time. You cannot afford to do nothing. You're headed for a disaster. It may be less expansive to install a new boiler that's vented through a side wall than to repair the chimney - especially if natural or LP gas is available. It would also be considerably more efficient. @BoilerOiler , where are you located? Gee, I wonder if the stack relay still works or are we having long delayed ignition? Temp gauge reads zero. PSI 12, what happens to pressure as temp comes up? is temp gauge broken? I see no aquastat, but there may be one, perhaps it isn't working either? @Jamie Hall Thanks for your response, yes its a gravity fed hot water boiler. I can't find a leak which makes me wonder if the system is draining the tank somehow? When I add water I can hear what sounds like water draining throughout the pipes, but that could just be the supply. Good idea on the carbon monoxide detectors. The chimney was cleaned regularly with the wood stove, but that doesn't mean it couldn't develop cracks. There have been two chimney fires at this house, and a neighbors house burnt down due to a chimney fire so I can attest to the danger of chimney fires. 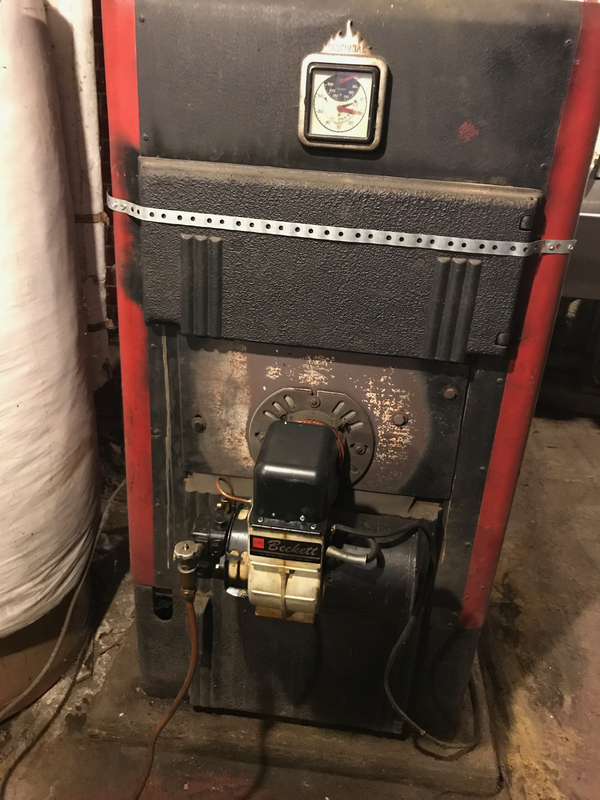 What would cause the fire to start with an oil boiler? The pressure gauge doesn't move while the boiler runs. @leonz Thanks for the response, replacing the boiler and keeping the expansion tank would be a good option. @Steamhead I'm in southern VT. The initial banging was so loud it sounded like something was exploding. A few people I talked to seem to think it was the lack of water that was causing the remaining water to "pop". a) Find a makeshift temporary solution (carbon monoxide detectors, adding water, new burner, new thermostat, and or new stack relay) Until I sell where I would fully disclose the status of this ol' girl. b) Buy a new boiler and hope to recoup the costs when I sell...Most everything in the house is in similar shape so this isn't ideal, but I'm thinking it might just have to get done. If the radiators aren't leaking, why would there be such a decrease in water? The leak would be very apparent at this point and I have walked the whole house without seeing as much as a drop. What is the purpose of those two 3-4" pipes running up to the bottom of the expansion tank? I really appreciate your responses, to say you guys know your stuff would be an understatement. The 2 pipes in the bottom of the tank may be there to produce flow thru the lower part of the tank. In effect it is just another radiator to prevent itself from freezing. The overflow pipe assures that there is always air above the tank water. (room for expansion of water as it gets hot). The overflow could be piped directly into you house drain pipes. Are all of your rad bled of air? If the level got low enough then air could be in the top of the rads. The air could now be passing thru your air bleeders that might leak air but not water. If the air squeaks out that way, then more water would displace it and your sight glass level might drop. Was the chimney relined after the chimney fires? If not, it's cracked -- pretty well 100% guarantee on that -- and it must be either relined, taken out of service ASAP, or torn down. It should not be used. 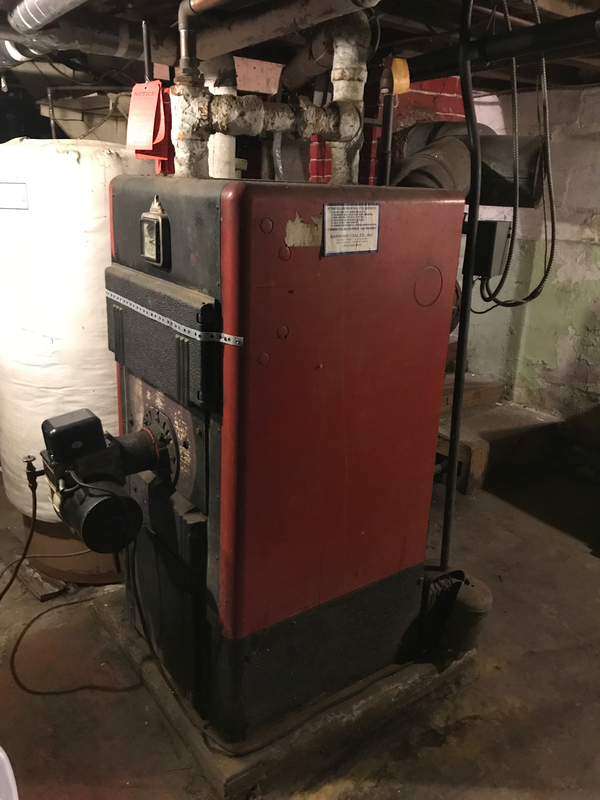 You are not concerned so much about the oil boiler starting a fire due to the cracked chimney -- although it can, since stack temperatures may be well above the ignition temperature of old wood -- as you are with killing whomever is in the house with carbon monoxide. Sorry to sound grim, but that's what it is about. Hot water heating systems -- gravity or pumped -- should not need makeup water. If they do, there is a leak. It could be in the piping. It could also be in the boiler itself, where you'd be unlikely to notice it. It will need to be found and fixed, too. You said you were selling this house, if the house over all hasn't been upgraded you may want to leave it, Vermont is still pricey for a fixer upper and people are looking for deals which are getting fewer to find there. You've got asbestos all over the pipes and under the jacket for starters, whoever buys that will probably gut it and do a complete refit. At least have a pro assure this is safe to run in the mean time, it really needs a personal look, photos just won't tell the entire story but it's doesn't look real good, and please have them be sure that the stack relay safety function actually works and the chimney is safe. Are you moving because of the existing boiler in the basement?? If you could upload more pictures of your heating system that would help us a lot and probably find the leak much more quickly for you. Your expansion tank is a gas and flux welded tank and it has held up very well by the looks of it. We need to know where the overflow pipe goes and and where it ends up. Can you take more pictures of the basement piping that extends from the boiler to the risers and the returns? About the pipe that goes along the floor and enters the concrete slab what is its purpose? If you are not sure please upload more pictures of where it comes out of the slab and where it goes if you would please. It would be worth your time to purchase an automotive stethoscope to listen to the pipes and perhaps the pipe that enters the concrete slab. No cad cell control on the burner so I hope the old stack switch is working!!!! Wonder if the banging is water hammer? Does the high limit temp safety switch work? Could be flash steam banging. Maybe some valves are closed and there’s too little circulation, or some orifices that were installed for balancing are corroded and it causing issues. Does it heat the house fairly evenly when it runs? leonz, in the basement the only pipe I see going into the floor looks like cast iron hub DWV. 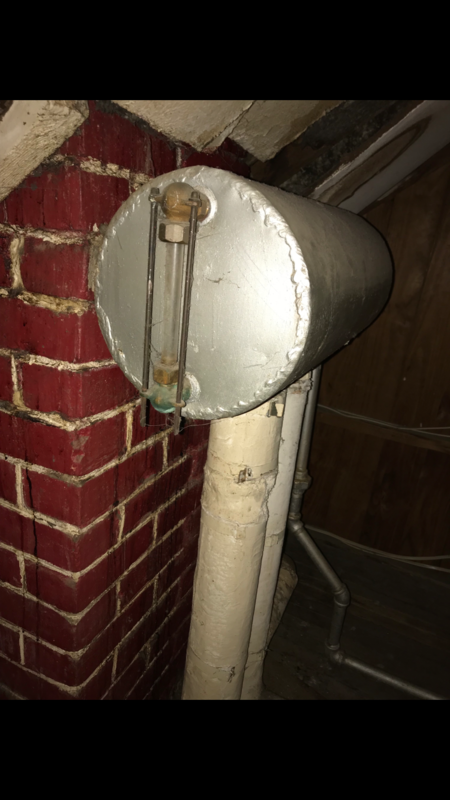 But I just notices three pipes in the attic that are insulated and eventually connect to the tank.....in addition to the drain line. Perhaps an expansion from the piping risers on each side of the house? And maybe the straight drop thru the floor is connected to the returns? This would provide flow thru both sides and then thru the tank down to a return? Have you added water back to the tank yet? About the insulated pipes one pipe is the hot water riser and the second insulated pipe is the cooler return line to the basement for the boiler and should enter the side or bottom of the boiler. Can you perhaps upload a drawing of the piping for us? @leonz I will take some more pictures right now. I tried listening to the video but I have trouble hearing anything from it. Is that pipe connected to the chimney at the floor line connected to anything???? It may be one source of the odors you mention. Your ash pit door must be put back on its hinges. I believe the ash pit door is on the floor just below the clean out. Have you found the drain line in the basement and is exposed so you can see water coming from it?????? You need to add water until you see it coming out of the drain line if it is visible OTHERWISE you have to leave the filler valve open and start at the first radiator and open the air vent to be sure to vent the air in the radiator and then go to the next one and on and on until the air has been purged. in the video what's up with the pipe that is disconnected going into the chimney? ?